The first full day of campaigning kicked off this weekend with John and a small delegation attending the Hiroshima and Nagasaki commemoration, at the Peace Bell in the Botanic Gardens. A small group of 10 went to support the First Union Pak’n Slave Stickman picket before heading out to the Lyttelton Farmers Market while the rest hit their distribution sectors. 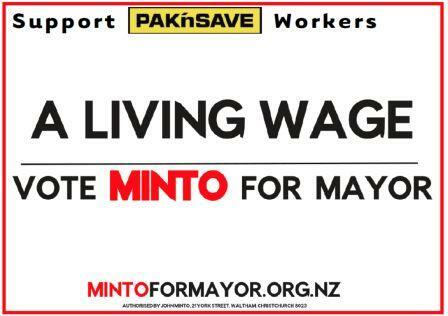 Pak’n Save workers in Christchurch are paid a minimum of $15.25 while their Auckland colleagues minum is $17.95. Earlier in the week we achieved our first policy victory with Council announcing that it would not proceed with the sale of City Care. The sale of city assets was sprung on the people of Christchurch after the last local body elections. It was never raised as a possibility before the election by the Mayor or any of the seven councillors who supported her initiative to sell assets. 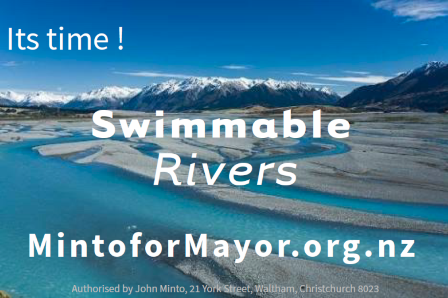 We want a mayor and council elected who will pledge not to sell assets. In the meantime we are chalking up one policy victory with five to go. End the corporate stranglehold on the rebuild with stiff rate increases on undeveloped land in the CBD. If you are keen to join the team flick us an email.